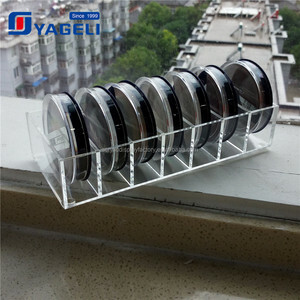 2018 Wholesale Black Customized Multi-Purpose Home Makeup Powder Compact Acrylic Organizer Company Anhui Yageli Display Co. ,Ltd Item Name Acrylic Compact Organzier / holder / case Material acrylic Function Display & Storing & Promoting OEM Design & Size Accept Logo Way Silk-Screen, Printing, scan, Sticker, Engraving Usual Color Clear, white, Black, red. 3. Storage Dry Seafoods, Beans, Toys Bins, cereals, bread and so on. Tags: . Organizes 8 Individual Compact Makeup Products | Strong Acrylic Material With Excellent Weather Resistant And Much Stronger Than Glass | Ccompartment Is Uniform Size. Acrylic Cosmetic Organizer Blush powder compact foundation acrylic makeup box Beautiful makeup divider. Has 56 compartments for blush, eyeshadow, compacts, lipsticks and many others. 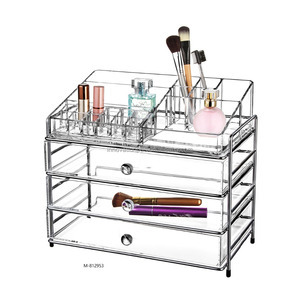 Made of Top quality crystal clear acrylic and is the premium for cosmetic organization. (2)Please don&rsquo;t hesitate to contact us if you have any question, we will reply you soon with professional service. Our goal: Not only sell our products,but also our sincerity service Not only seller to buyer,but also freinds to friend. If you have any problem with you purchase, please let us know immediately and give us a chance to resolve until you are satisfied. &middot; These cosmetics display stand is widely used in shopping malls, cosmetics stores, beauty shops, supermarkets and so on. 2. 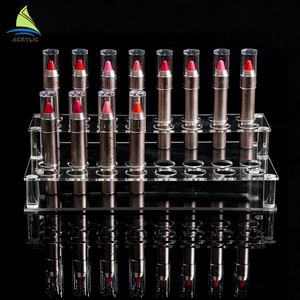 Acrylic cosmetic display units are a professional and fashionable way of displaying and storing beauty products. 3. Acrylic cosmetic makeup display cabinets are widely used in retail store, shopping mall, supermarkets, exhibitions, trade shows, etc. 4) Professional foreign trade operations 6) Good after-sale service. 2. Production / inspection report before your order shipped. After Sales Service 1. We respect your feedback after receive the goods. 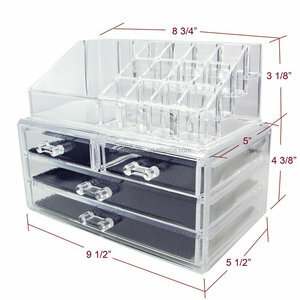 Alibaba.com offers 402 compact acrylic makeup organizer products. About 34% of these are display racks, 28% are storage boxes & bins, and 12% are cosmetic bags & cases. 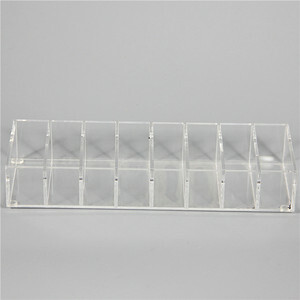 A wide variety of compact acrylic makeup organizer options are available to you, such as plastic, acrylic, and aluminum. You can also choose from eco-friendly, folding, and stocked. As well as from sundries, tools, and food. 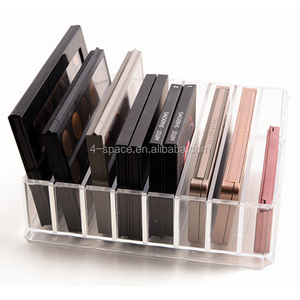 And whether compact acrylic makeup organizer is free samples, or paid samples. 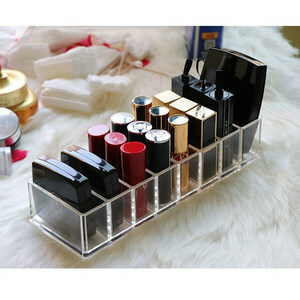 There are 323 compact acrylic makeup organizer suppliers, mainly located in Asia. 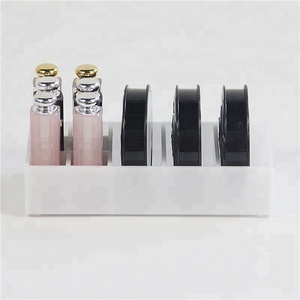 The top supplying countries are China (Mainland), Canada, and Taiwan, which supply 92%, 6%, and 1% of compact acrylic makeup organizer respectively. 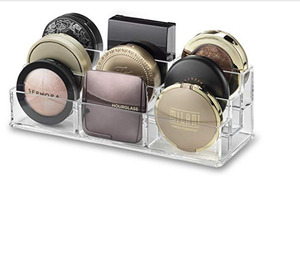 Compact acrylic makeup organizer products are most popular in North America, Eastern Europe, and Domestic Market. You can ensure product safety by selecting from certified suppliers, including 24 with Other, 17 with ISO14001, and 13 with ISO9001 certification.